The Diocese of Shrewsbury covers the parts of Merseyside south of the River Mersey, the southern parts of Greater Manchester, parts of Derbyshire, the counties of New Cheshire – apart from parts of Warrington and Widnes – and the whole of Shropshire. Most of the Catholic population is concentrated in the urban and sub-urban areas of the north of the diocese to which many Irish migrants flocked during the Industrial Revolution. This area includes the Wirral peninsula in the extreme north west, which is home to the diocesan curial offices in the Birkenhead suburb of Prenton, and Wythenshawe, south Manchester, and the town of Stockport in the east. The north-eastern extremity of the diocese stretches into the foothills of the western Pennines, however, encompassing Stalybridge, Dukinfield, and Hyde as well as Macclesfield. Moving southwards from Altincham and Sale, Runcorn and Frodsham, the diocese serves all the towns and villages on the Cheshire plain – including Knutsford, Northwich, Middlewich, Winsford, Tarporley, Congleton, Crewe, Nantwich, and Malpas – as well as the major centre of Chester itself. There are comparatively fewer Catholics living in the towns of Shropshire, one of the most sparsely-populated counties in England. 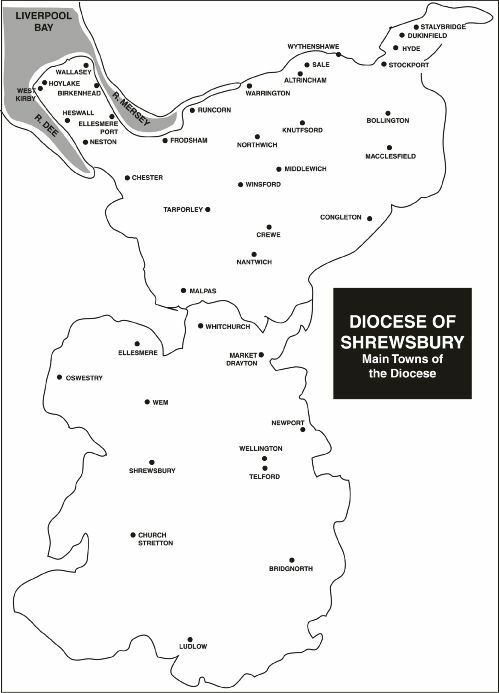 The diocese stretches further south than Ludlow, taking in Telford, Newport, Bridgnorth, Oswestry, Market Drayton, Whitchurch, Wellington, Ellesmere, Church Stretton and, of course, the historic town of Shrewsbury where the seat of the Bishop – the Cathedral Church of Our Lady Help of Christians and St Peter Alcantara – is situated.